Thanks and Appreciation Goes to . . . I'm writing this in my hotel room in NYC on the morning of my departure back to Los Angeles. I came to Manhattan to attend the 15th annual International Latino Book Awards with no expectations, even though I was pleased that my book was a finalist in two categories. My competitors are skilled writers. The picture to your right was taken after I received my first award. 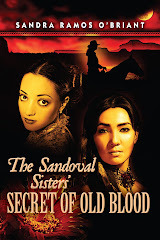 The Sandoval Sisters' Secret of Old Blood took home first place for Best Historical Fiction and Best First Book. There are many people who helped and encouraged me, but I want to focus on The Latino Author site this morning. Authors still have to do a lot of their own marketing: we often have to beg for reviews. Imagine my surprise this past January when a venue I had not yet contacted (euphemism for beseeched, pleaded, nagged) included me in their list of top 10 books for 2012. 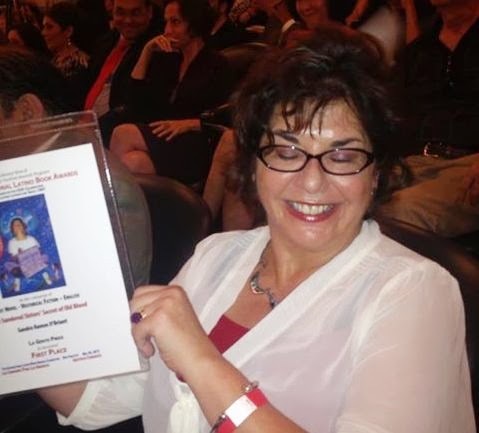 Not only that, The Latino Author slotted me into a #5 position after best-selling authors Junot Diaz, Julia Alvarez, Sandra Cisneros, and Reyna Grande. In some esteemed journals, book reviewers have begun to sound as if they’re walking a tightrope between keeping their jobs and telling the truth about what they really think. What I like about Corina Martinez Chaudhry’s review in The Latino Author is that she sounds like a book enthusiast who had an enjoyable read. Her inclusion of my book pumped me up at a time when my confidence was lagging. 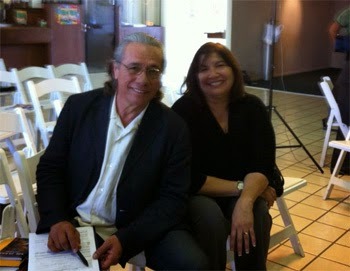 My profound gratitude goes to her and The Latino Author for promoting my work. Can you imagine a world without writing, reading, books or being inspired? Fortunately for us we live in a world of books from inspirational works to literary masterpieces. It is these very things that inspired us to put this website together. We wanted to create a one-stop forum with writing tools, techniques, and information for emerging authors! We wanted to inspire authors to write their “masterpiece” to share with the community and the world! We wanted to provide a forum for readers to locate that special book and connect with their favorite author! We wanted to showcase and extend the word on the many Latino authors that have inspired and enlightened us with their literary works and will continue to do so for many years to come! We have a strong commitment to excellence and to bring more enthusiasm and passion to the Latino/Hispanic literary communities. Our hope is to assist emerging authors realize their dream of writing and to broaden the sphere of author’s literary works.